Announcing the 18th annual Sopchoppy Worm Gruntin’ Festival . 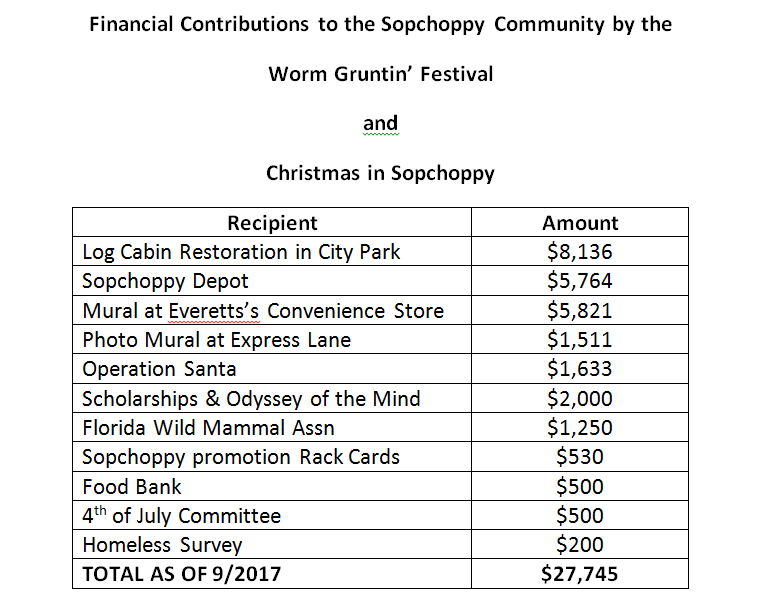 The eighteenth annual Sopchoppy Worm Gruntin’ Festival, a one-day outdoor event in the streets of historic downtown Sopchoppy, Florida, will be on Saturday, April 14, 2018. As always there will be live music and other entertainment, a 5K race, games for children and adults, the Worm Gruntin’ Contest, the Wakulla County Horseshoe Championship, a Hula Hoop Contest and much more. In the evening, we will dance under the stars at the Worm Grunter’s Ball. And, entrance is all free and open to the public. If you love our Worm Gruntin T-Shirts, you can get them at EVERETT’S in Sopchoppy. A new supply of 2017 shirts in all adult sizes are now available! EVERETT’S is located at 2146 Sopchoppy Hwy (US 319), Sopchoppy, FL. Contact Everett’s at: (850) 962-1116, ltrice@centurylink.net.